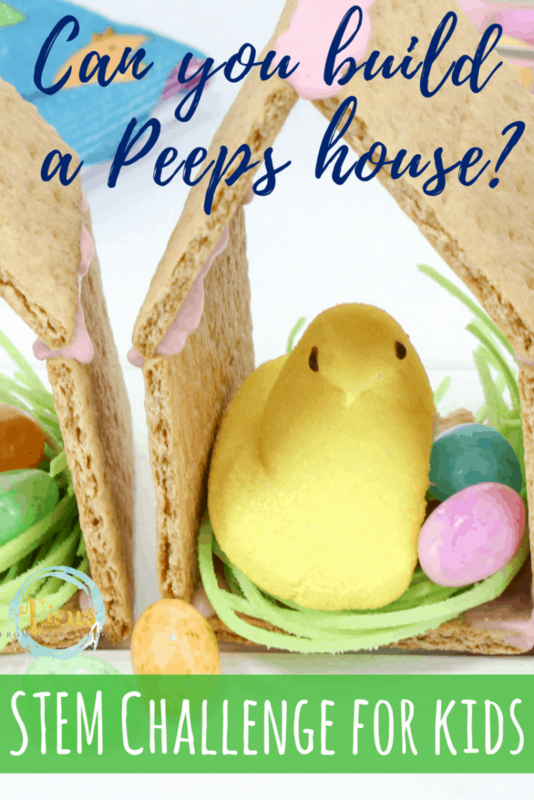 Can you build a Peeps house? 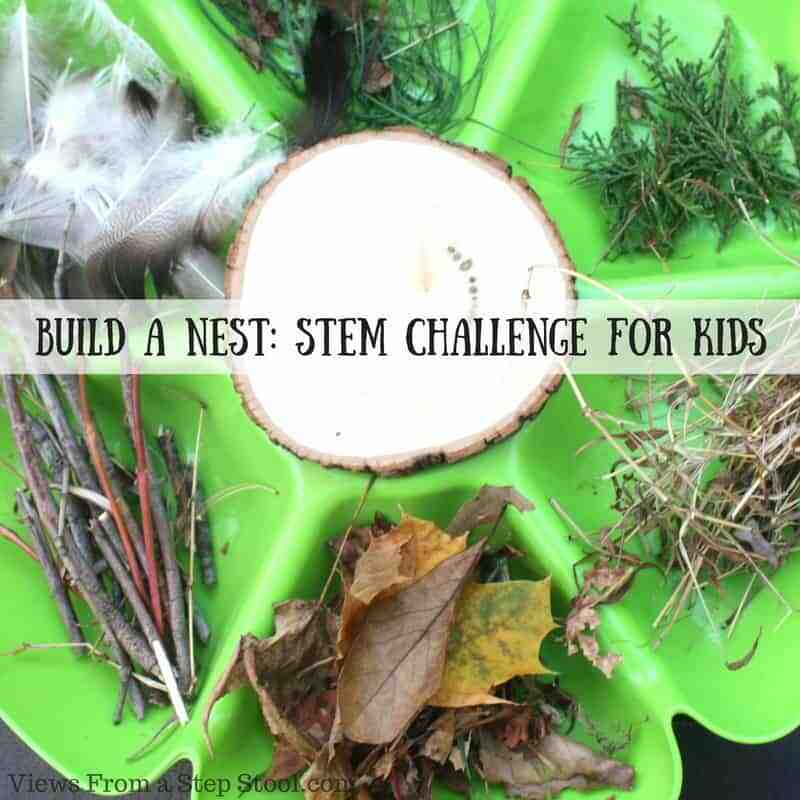 This Easter STEM challenge for big kids is perfect for the Spring. 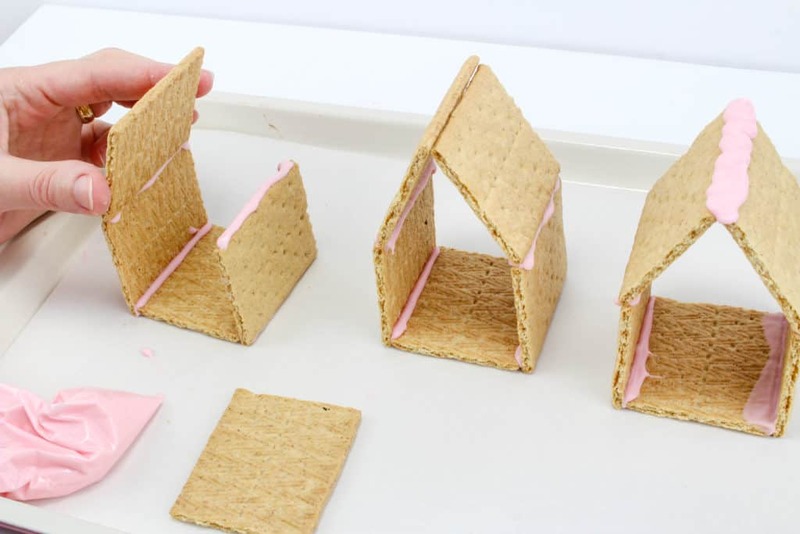 Using graham crackers and frosting, will the house stand? Building a house out of food can be an awesome way to create a STEM challenge that helps kids understand cause and effect and a bit of problem solving skills. 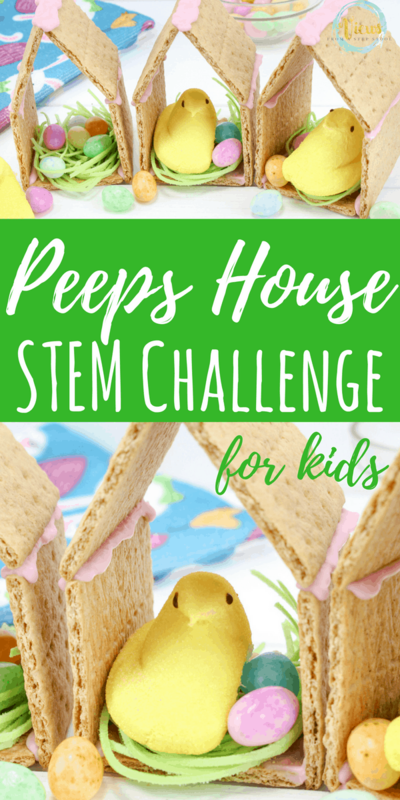 Put a bit of a spin on the classic Winter gingerbread house to build a Peeps house in the Spring in this fun Easter STEM challenge! 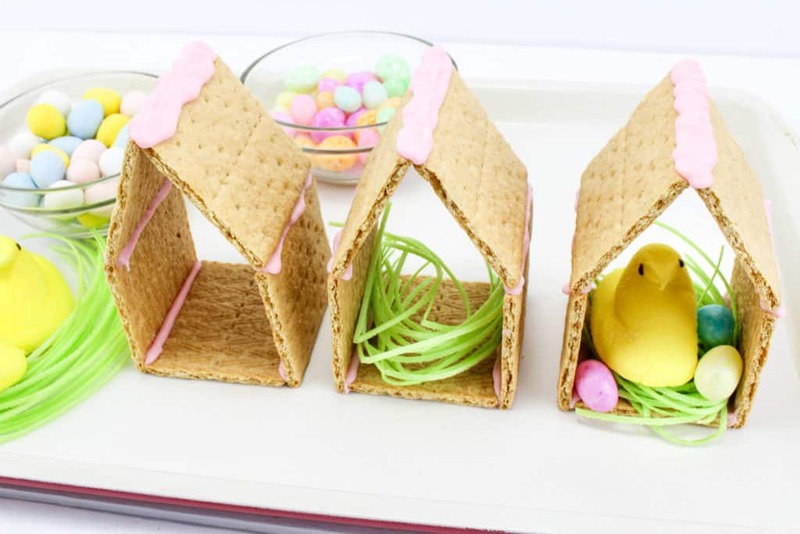 This STEM Challenge is inspired by these adorable Peeps houses by The Jersey Momma. STEM challenges help kids test out theories and make predictions, all while having fun! 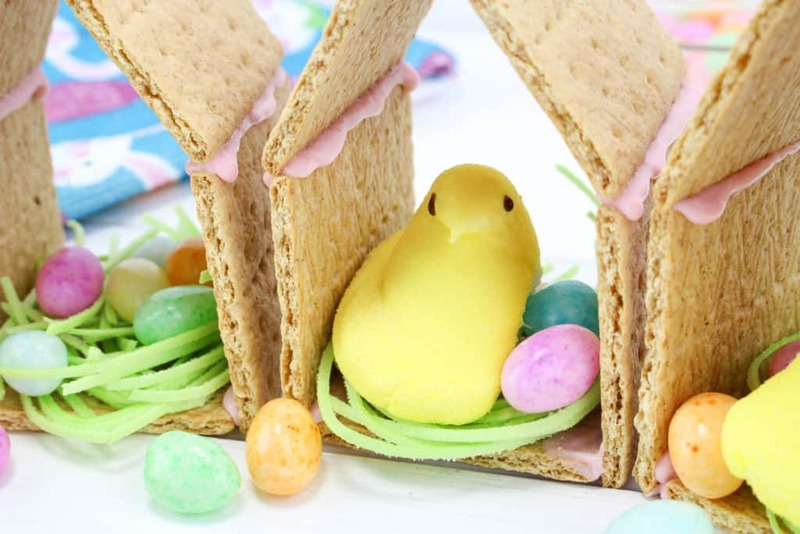 Can your big kid figure out how to build a Peeps house? 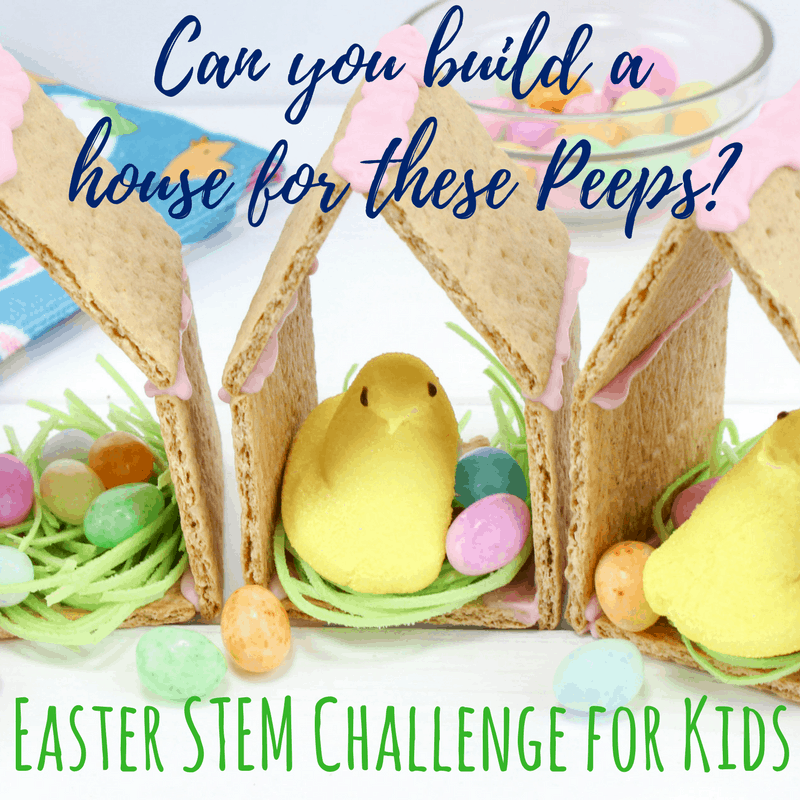 What a fun STEM challenge to do in the Spring (bonus if it’s after Easter and all the Peeps are on sale!). 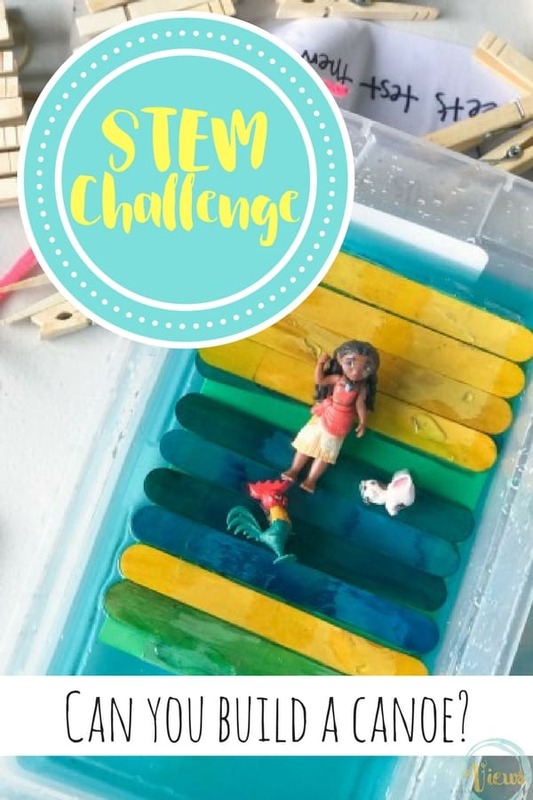 And, if you buy extras like me, try out this STEM challenge with peeps AND jellybeans from Little Bins for Little Hands! Melt the chocolate melts according to package directions and put it in a small plastic bag or piping bag. 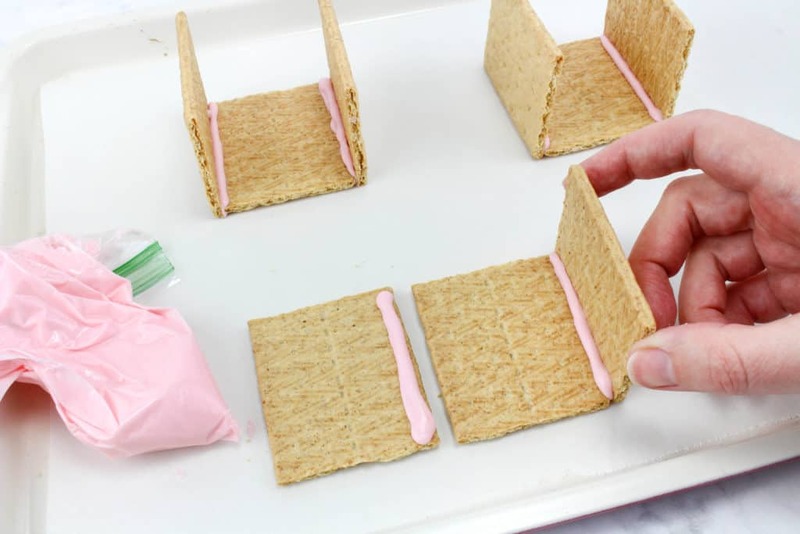 Kids can experiment with using the melted chocolate and the graham cracker pieces to build a house! If you want to direct the process at all, children can lay a graham cracker down and pipe a line of chocolate on each side of a graham cracker half. Stand a graham cracker half up on each line of chocolate. Hold them until the chocolate sets, about a minute or so. Then, they can pipe a line of chocolate on top of the two graham crackers that are standing up. Then take 2 more halves and place each one on the chocolate and bend them towards each other so they touch at the top like a roof peak. Hold them for a minute or two. Then pipe a thick line of chocolate right on the crack where the two roof sides meet at the peak. Let this set for 3-4 minutes. 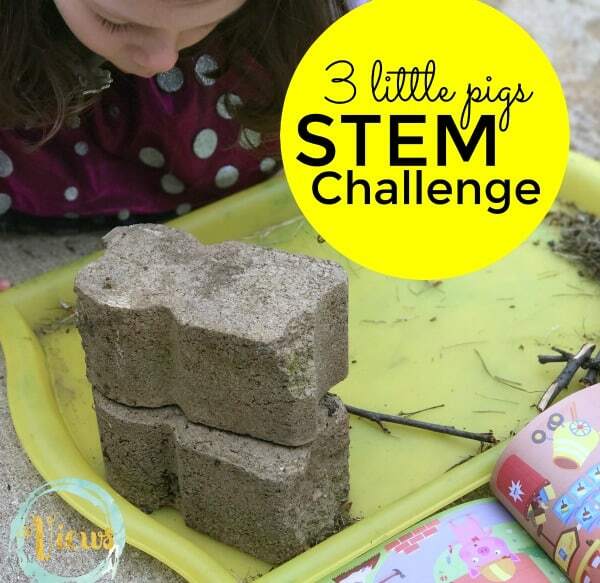 Let the kids experiment with this Easter STEM challenge! 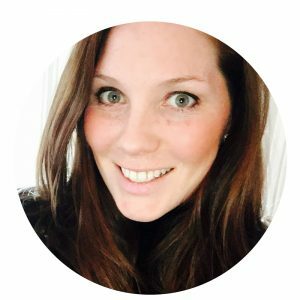 It’s really fun to see what kids can come up with on their own first! This is what makes this process an Easter STEM challenge! Remind your children that failure in science is how we learn. This allows us to see which mistakes we made and further improve upon them. This also helps develop a growth mindset in children. Once your child has successfully made a structure, put some of the edible grass into each chicken house that you made. Set a peep chick in each one. Add a couple Easter candy eggs around on the grass in each chicken house. 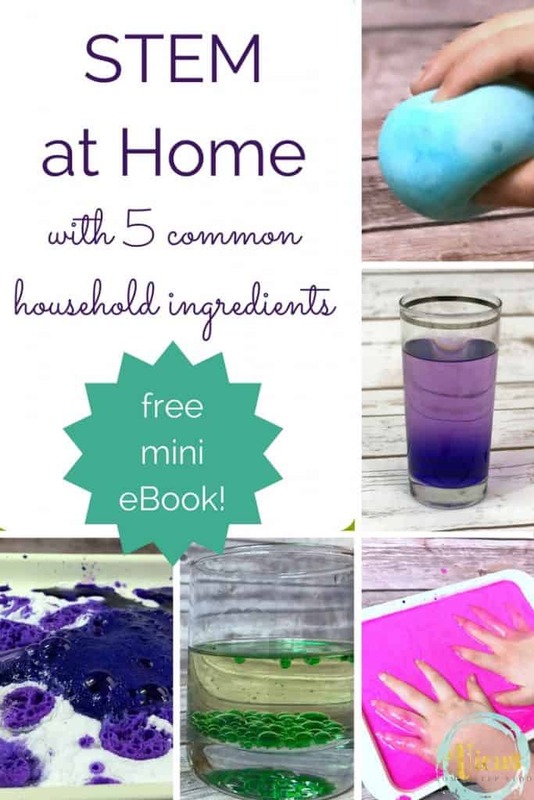 What a cute and fun treat for Easter that the kids can all help make all in a fun STEM challenge! What do you think? 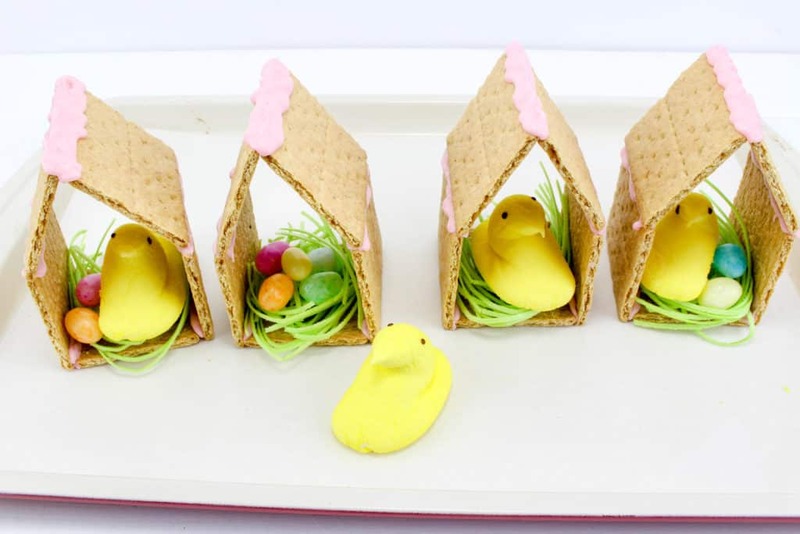 Can your kids come up with a great way to build a Peeps house? How many tries will it take? Can they use their problem solving skills? Give it a try!